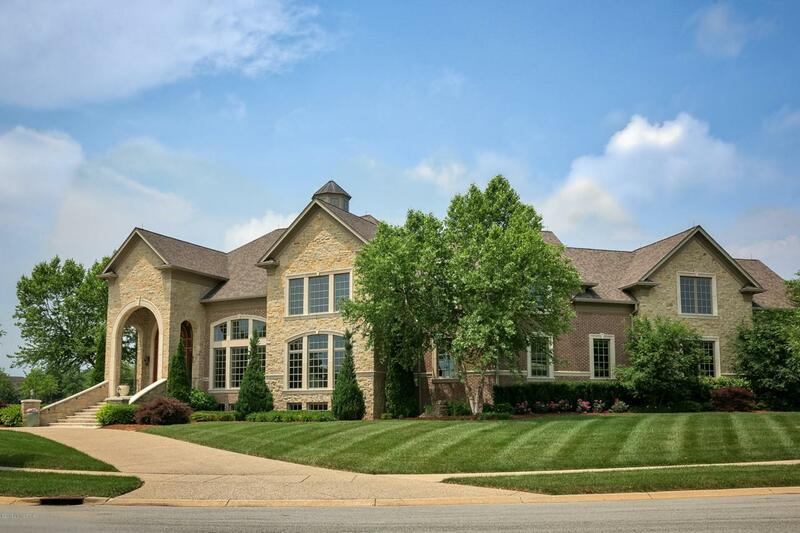 This exquisitely and meticulously designed and built 4 (or 5) bedroom, 5.5 bath home in the sought-after Spring Farm Place neighborhood off of Wolf Pen Branch Rd. is wonderfully situated directly across from Spring Farm Lake. This prime and unique location within this attractive neighborhood with sidewalks, and fishing for residents, results in spectacular, serene views of the water from many of the rooms in this home. The beautifully crafted front entry door welcomes you into the sensational window filled two story foyer and great room. A spacious eat in chef's kitchen and wet bar area offers handsome custom cabinetry, granite and GE Monogram and other high-end appliances.It leads conveniently to the inviting outdoor covered terrace with outdoor kitchen and fireplace, and to the large level backyard (suitable for a pool if desired). The kitchen opens to the bright hearth room, a perfect gathering room for casual dining and/or relaxing. The beautiful first floor master suite has its own laundry room and a fabulous bathroom with fireplace, bathtub and spectacular walk in shower. Completing the first floor is a formal dining area, a half bath, a pantry and the first of 3 deep and large closets (one on each floor) which are conveniently sized/shafted for an elevator should one be desired by a new owner. Entry to the spacious attached 3 car garage is conveniently located off the kitchen. Upstairs you'll discover 3 very generously sized ensuite bedrooms, a laundry room, and a marvelously gigantic, bright, open room ideal for an upstairs game/play/family room, or a large office or studio - or reconfigure this space to add an additional bedroom or two if needed. The lower level is equally finely finished, offering a family room, a pool table room, a large media room, a bedroom/office, a full bath, an artistically designed bar kitchen, and an awesome wine cellar. Finely crafted high-quality millwork, and the not often experienced gorgeous hickory hardwood floors cover most rooms throughout the home, and yes, all of this is on all 3 levels. The spectacular staircase and cupola and many thoughtful artistic design elements simply must be experienced. Smart technology is installed throughout. Most windows in the home have discrete electronic window shades for privacy when desired. Expense was not spared in order to achieve the beauty, quality, ambience and comfort this home presents. Listing provided courtesy of Kentucky Select Properties. © 2019 Metro Search, Inc. All rights reserved. © 2019 Greater Louisville Association of Realtors. All rights reserved. IDX information is provided exclusively for consumers' personal, non-commercial use and may not be used for any purpose other than to identify prospective properties consumers may be interested in purchasing. Information is deemed reliable but is not guaranteed accurate by the MLS or The Sokoler-Medley Team - RE/MAX Properties East. Data last updated: 2019-04-20T16:58:14.117.